When you have a smartphone, it is of course used hours and hours every day. You use it at home, going to and from work, or school and you just throw it in your bag or pocket, then you're good to go. While you think your device is safe in the soft case or pocket, its screen can get scratched. Nightmare is when you accidentally drop it, and whilst they will not necessarily get damaged on the back-piece, your screen can get a nasty scratch mark(s) on it. This is something that every phone user just hates to the Moon and back. Insurance can be expensive, but you don't have to leave your phone's protection to chance. What can you do to protect your phone from possible disaster? Each of their screen protectors is crafted from intelliGLASS™, their most advanced protection yet. intelliGLASS™ is crafted from hardened glass that offers better than steel scratch protection, an oil and smudge resident outer coating, and advanced silicone adhesion that eliminates bubbles and permanent residue. The result is unmatched protection with out losing clarity or touchscreen sensitivity. 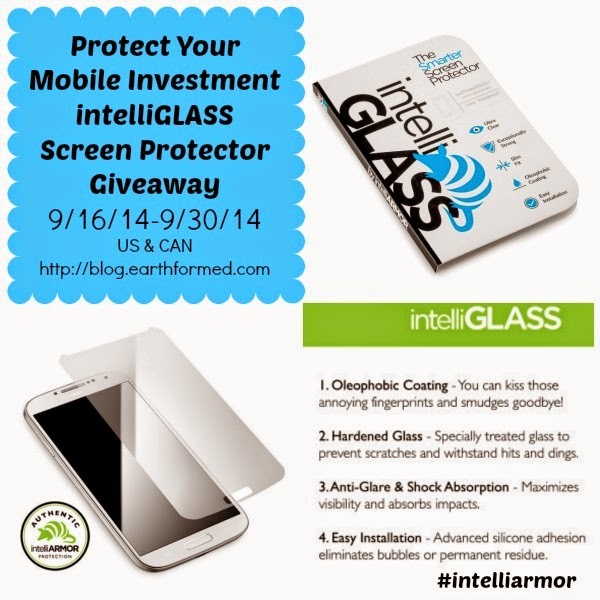 One lucky winner will receive an intelliGLASS Smarter Real Glass Screen Protector for their smart phone. Giveaway is open from 11PM 9/16/14 to 11:59PM 9/30/14 to residents of the US and Canada ages 18+. Winner will be notified via email from **promos @earthformed .com** and will have 48 hours from the time stamp of notification email to respond with a valid US or Canada shipping address (no P.O. Boxes) and phone number. If no response is received within the 48 hours window a new winner will be chosen. Disclosure: Spring Of Health and other participating blogs are not responsible for prize fulfillment nor the giveaway. If you have any questions, comments or concern regarding this event, please contact Lucero at We Are Earthformed. Lucero from We Are Earthformed received products from this sponsor to facilitate her review, no other compensation was received. This giveaway is in no way associated with social media sites including Facebook, Twitter and Pinterest.